Crown, cap, top for decorating craft Christmas ornament. Measures approximately 1-7/8 inches in diameter. Plastic. 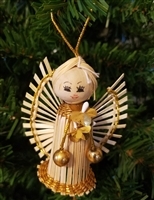 Miniature White Angel with Fruit Basket Christmas Ornament. Measures 1-1/4 inches in length. Plastic. Star measures 2-1/4 inches wide. Includes 4-prong center for holding a bead or other embellishment. Center measures half inch wide at the base and 5/8 inch wide at the top. Measures 3 inches in diameter. Includes small 2mm hole in top and bottom for stringing/hanging. Plastic Seashell Clam Shell for Christmas Tree Decoration, Crafts, Wreath Making, or Nautical / Mermaid Party Decoration. Color: Gold. Size: 2-3/8 by 2-1/8 inches. These do not open. 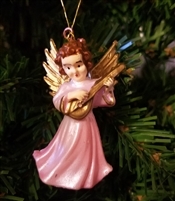 Miniature White Angel with Violin Christmas Ornament. Measures 1-1/2 inches in length. Plastic. Crown, cap, top for decorating craft Christmas ornament. 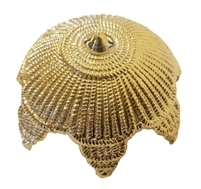 Measures approximately 2-7/8 inches in diameter. Plastic. 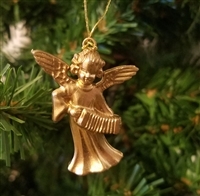 Miniature Gold Angel with Accordion Christmas Ornament. Measures 1-1/2 inches in length. Plastic. Great for embellishing Christmas crafts, wreaths, or other decorations. 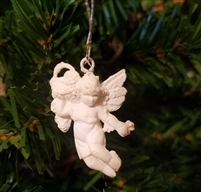 Angel ornament measures 2-1/2 inches long. Made of natural raffia straw with a painted wood bead for a head, and embellished with metallic gold thread. 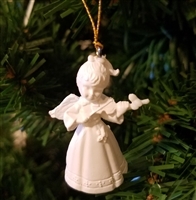 Painted plastic angel ornament. Measures approximately 2 inches in length. Light-weight. Great for embellishing Christmas crafts, wreaths, or other holiday decoraitons.